Vous pouvez également utiliser 8000 Kobo Super Points pour l'obtenir ! On July 24th, 2004, author Graeme Cowan took pen to paper and said goodbye to his family. “I just can’t be a burden any longer,” he wrote. After four failed suicide attempts, and a five-year episode of depression that his psychiatrist described as the worst he had ever treated, Cowan set out on a difficult journey back from the brink. 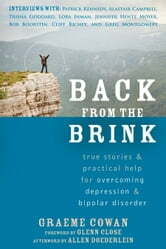 Since then, he has dedicated his life to helping others struggling with depression and bipolar disorder—and that is how this book came to be. If you have severe depression or bipolar disorder, it is important to remember that you are not alone. 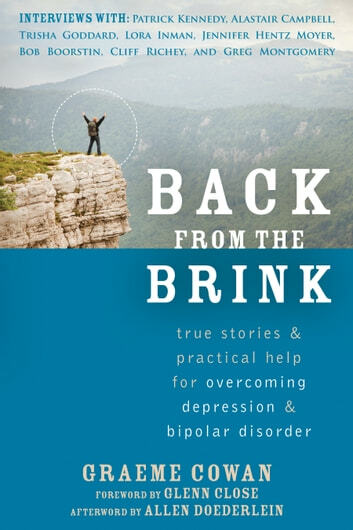 Featuring interviews with people from of all walks of life, Back from the Brink is filled with real stories of hope and healing, information about treatment options and medication, and tools for putting what you've learned into practice. If you are ready to put one foot in front of the other and finally set out on the path to recovery, the powerful stories in this book will inform and inspire you to make lasting change. If you have severe depression or bipolar disorder, you may find it difficult to take that first step toward recovery. You aren’t alone. In our society, many people with depression or bipolar disorder do not seek therapy or medical treatment due to the stigma that surrounds mental illness. Even people in “progressive” communities may not want to admit that they are on antidepressants or mood-balancing medications. Isn’t it time we changed the way we thought about these illnesses? The book includes a special foreword by actress Glenn Close, and features in-depth interviews with former US Representative Patrick Kennedy; television talk-show host Trisha Goddard; director of public policy at Google, Bob Boorstin; former chief advisor to Tony Blair, Alastair Campbell; former tennis pro, Cliff Richey; former professional football player, Greg Montgomery; and many more. My own big crisis is a few years back but lately I've been struggling with downs and anxiety. This book has been a great comfort, and inspiring and reassured me that the steps.I'm taking in my own life ware valid and helpful choices. Will recommend this to friends affected by mental health issues.